Following a number of structural reforms since the University’s inauguration as the Tokyo Senmon Gakko (College of Tokyo), the Bureau of Physical Education was established in April 1952. It combined the sporting clubs as extracurricular activities and the in-curricular Department of Physical Education for the purpose of unifying and enhancing the University’s physical education policies. A half-century later, the Bureau was proactively reorganized into the Athletic Center in April 2003. The Center is engaged in various activities to promote sports within the University, while administering athletic clubs and liaising with a diversity of institutions both internally and externally to support club activities. Waseda Campus, Toyama Campus, Tokorozawa Campus, Higashifushimi Campus, Kamiigusa Ground, Kami-Shakujii Golf Center , Toda Rowing Course, Matsushiro Driving School , Hakkeijima Marina, Menuma Glider Port , etc. On November 5, 1903, the Waseda Baseball Club sent a challenge letter to the Keio University baseball team, its forerunner. It is believed that this challenge was originally proposed by Shin Hashido, the second captain of the Waseda baseball club. Thus, the first ever Waseda-Keio Game took place on the Keio’s athletic grounds in Mitatsunamachi, on November 21 at one thirty in the afternoon. The game ended with an 11 to 9 victory for Keio, but Waseda played well nevertheless. This is how the tradition of the “So-Kei” (short for Waseda and Keio) games started. Following this tradition, various So-Kei matches unfolded in sports and other fields. 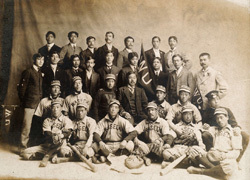 In 1905, the Waseda baseball team travelled to the United States to learn the latest skills in the sport’s country of origin. Upon their return, the team played in the scheduled So-Kei game again. 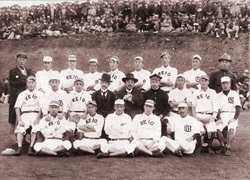 In 1906, however, the supporter groups on both sides became over-enthusiastic to the extreme, so much so that President Kamada of Keio University paid a visit to Count S. Okuma and Mr. Abe, the Waseda baseball club general manager, to discuss and call off the So-Kei game altogether in order to avoid clashes between the supporter groups. Subsequently, Waseda played against the teams of other universities, such as Meiji, Hosei, and Rikkyo, but never again with Keio. Later, the Imperial University (the present-day University of Tokyo) joined the league and formed what is today known as the Tokyo Big6 Baseball League. Nineteen years later, the So-Kei games were revived on October 19, 1925. The game took place at the Waseda University Totsuka Baseball Grounds . Then-captain Abe stood on second base on the Totsuka grounds, and declared the return of the So-Kei games. He addressed the spectators, saying that supporters on both sides were to display exemplary behavior, which was greeted with applause. The game that followed was also excellent. The game ended with an 11 to 0 victory for Waseda. The team continued to win the league that followed, and went on to champion the 1925 Autumn League. Today, 37 out of 44 clubs enjoy a rivalry with their Keio University counterparts, engaging in their So-Kei games. These clubs include tennis, rowing, kendo, rugby football, soccer, basketball, and more. The Waseda University Athletic Center liaises with the Keio University Athletic Association. On the Athletic Association’s website, the page dedicated to So-Kei games is adorned with the original letter of challenge to Keio University for the Waseda-Keio match*, written by Waseda’s second captain, Shin Hashido. *Archived at the Fukuzawa Memorial Center for Modern Japanese Studies, Keio University. (Baseball club general manager Isoo Abe, captain Shin Hashido, and club members from both Waseda and Keio Universities) 1904. (General Manager Abe and Waseda baseball club members. The party took three WU flags with them.) 1905. Waseda University celebrated its 125th anniversary in 2007. Each thread of the fabric of the 125-year history has involved so much effort and dedication. In tandem with the start of the second century of Waseda Sports, the Athletic Center and Waseda sporting club members paid homage to our predecessors’ dedication to sports at Waseda University, and adopted the Waseda Athlete Proclamation as guiding principles for Waseda athletes and as a charter for Waseda University athletics. 125 years have passed since Waseda University was inaugurated, and it has entered a new century. During this period, Waseda Sports has led collegiate athletics and made major contributions to Japan’s sporting culture and tradition in competitive disciplines. We, Waseda athletic club members, proclaim that we will perpetuate the spirit and morals that have been nurtured in the past, and endeavor to further develop Waseda Sports in the future. Thus we hereby proclaim ourselves to be Waseda Athletes. We understand the true character of sports, and endeavor to train and improve ourselves in sporting skills as well as personality traits. We are proud to be members of Waseda University and play in its athletic clubs, for which we strive to be exemplary in front of other students. As we engage in competitive sports, we respect our opponents and maintain a sense of gratitude toward all those who offer their support and encouragement. We strive in communicating and cooperating with local communities and wider society through Waseda Sports. We foster global perspective through international exchange built upon Waseda Sports. Through Waseda Sports experiences, we aspire to become individuals whose worth may be found in contributions to society.